Book Review – The Sequel! Between Us Only! The Oman Daily Observer! | My Majid Books! Home » Between Us Only! » Book Review – The Sequel! Between Us Only! The Oman Daily Observer! Between Us Only! The Sequel - 3! The Sequel - 3! Between Us Only! Book Review – The Sequel! Between Us Only! The Oman Daily Observer! Demonstrating his sharp eye, value for culture and tradition, and fearlessness, acclaimed columnist Majid Al Suleimany upholds the witty bravado of Between Us Only to bring forth the second volume of his great collection of commentaries from The Oman Daily Observer. 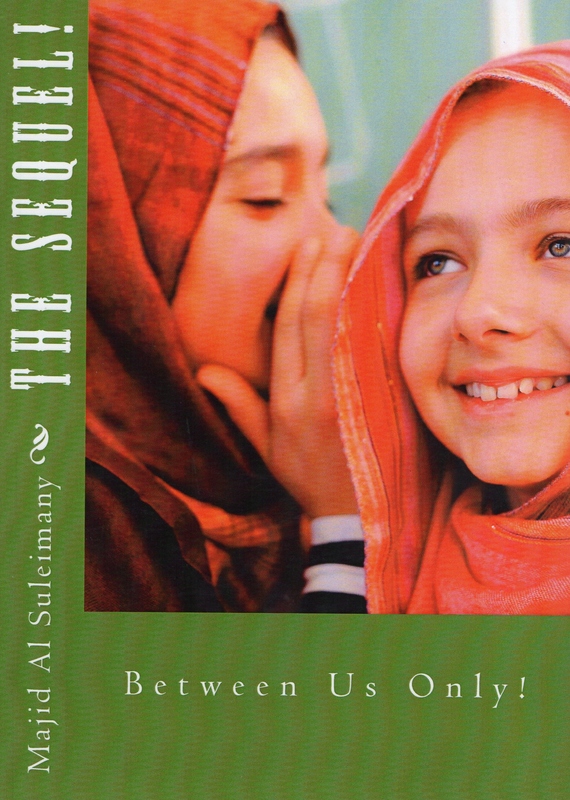 The Sequel once more invokes Al Suleimany’s clever and arresting writing, including his frank analyses, outlooks, perspectives, and views of the international arena, and as an author from The Moderate (GCC) Camp. Touching readers with clear, elegant prose, and that ever-present humor even in the most serious of topics, Al Suleimany brings his twenty-first century Arabic point of view to enlighten, inform, and charm you once more. 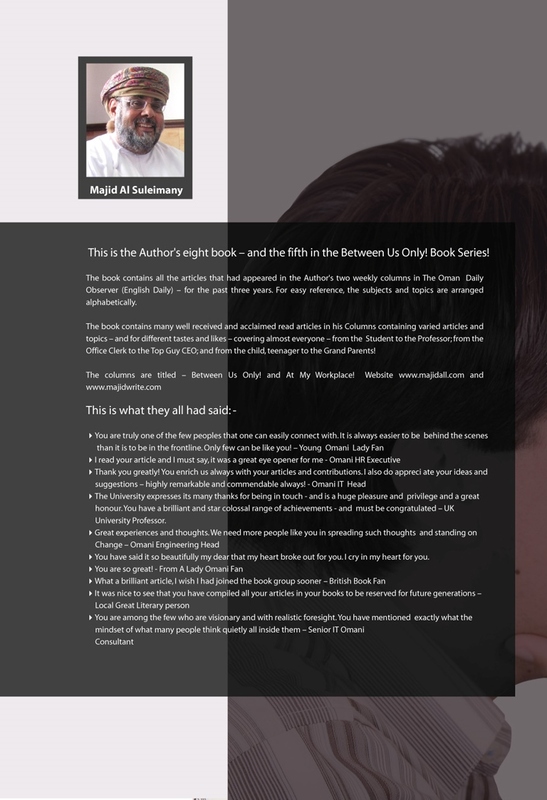 See http://www.alsuleimany.com for more books details. Available locally Family Bookshops, Borders and Turtles in Oman. Magrudy’s in UAE – and Borders soon. Between Us Only – The Sequel! Trafford Publishing (Canada), 422 pages. 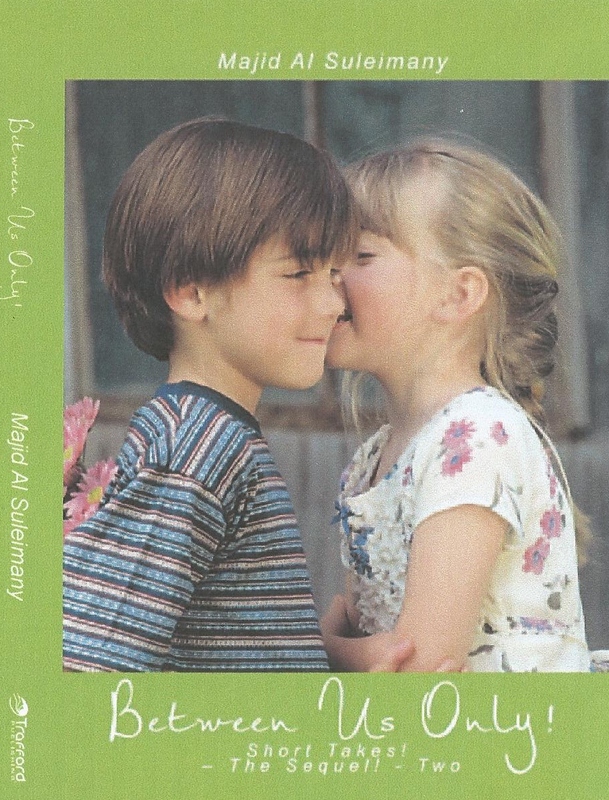 Between Us Only – The Sequel! 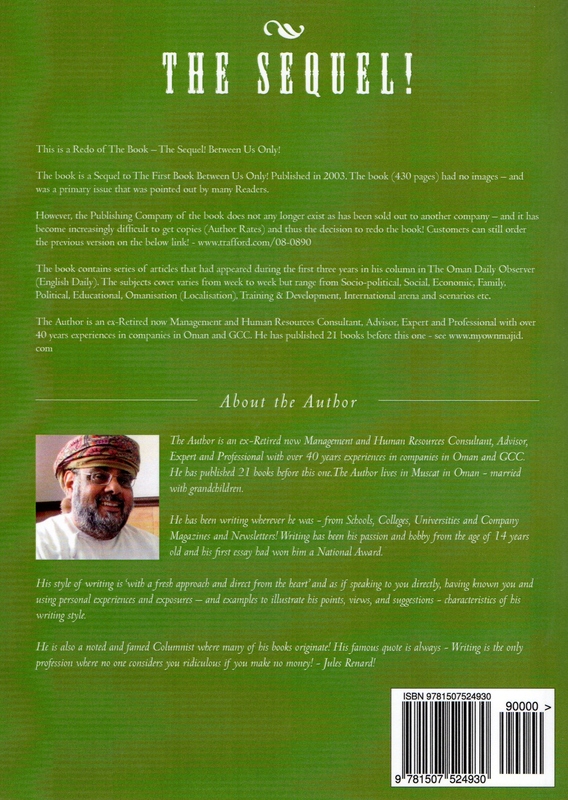 is a collection of columns published in The Oman Daily Observer by the Author from January 2005 to July 2008. It is part of personal thoughts of the Author on the day-to-day happenings in the society, part satire, part analytical, but in the long run, it does really matter – it is cautionary and advisory. It is the second book on the same line, and while it is overdone at times, it is still a fun reading enjoyable experience. In his impressive style, Majid skilfully combines the pride and prejudices of the society, love and hate, vanity, pomp and show with a mixture of elements of caution to show that somewhere something is lacking and eventually leaves the readers to find out the answers. Sometimes one may feel that Majid is adopting a style of the famous American writer Art Butchwald. No, he is not copying anyone’s style, it’s his own personal genre, and fortunately for us, he does it well! He also deals publicly with more serious aspects of culture and social life. It provides a point to ponder, people should believe in it. As a Human Resources Development Specialist and Expert of more than two decades of experience his favourite jumping-off point is Office Politics. His entertaining, but at times not so pleasant, column must have won him new friends and foes in various sections of the society. He wants to be known as a Writer, not a Columnist. It’s one step up, and that’s the direction he is heading at this stage. Majid also writes about his ups and downs in life with an openness which must have been a reason to win him lots of fans across the country. Exploring the underbelly of the society – hypocrisy – Majid tells his readers to pray so that Almighty May Protect all of us. Whatever others may think, his intentions seem to be very plain – love your country, love your culture and love one another. Where he is right is in underlining the fact that some people are encouraged by elites who take ludicrously short-sighted decisions which in the long run costs the people dearly. Highly recommended reading for all. USA Edition – Early Copies! http://www.createspace.com/4153263 – Book Website – Amazon USA! 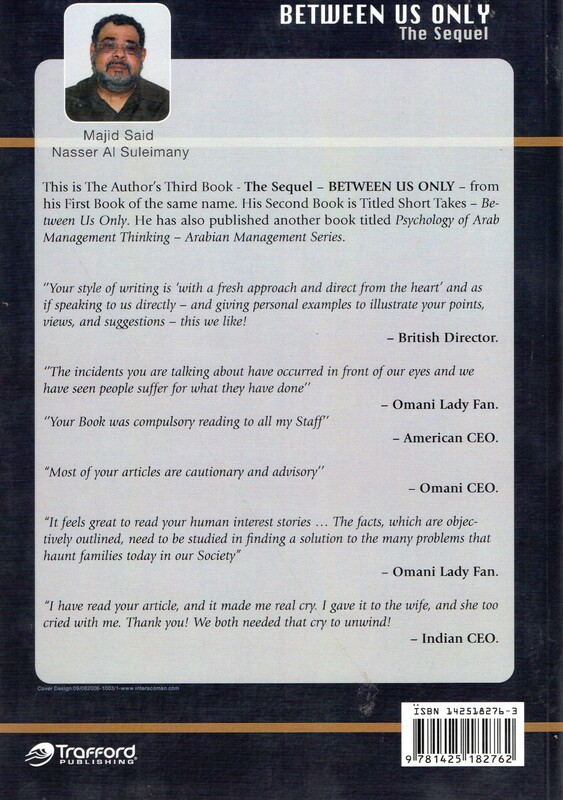 http://www.createspace.com/5253909 – Book Website – Amazon USA.